Time: at about 07:30 P.M. The second witness is Miss Locaer, resident of Sully-Prudhomme street in Brest, and the phenomenon which she witnessed is also very precise and very clear. "I returned home Thursday, at about 07:30 P.M., and I had slightly bent down to get the key of the entry door which was in my handbag. It is when I stood straight again that I saw the machine. It appeared me to come from the slaughter-house exactly as if it had just taken off. It had the shape of a glowing cigar, barred of a dark ring in its middle and surrounded by an aureole. It moved at a vertiginous speed, then stood right suddenlyly and the bolide then took the direction of the sea." Miss Mocaer managed to observe the phenomenon during several seconds, but when she went at her window to observe it more attentively, it had disappeared. The narrative in the GEPSI report seems to me obviously copied from some newspaper article, but the source is not given. Luc Chastan indicates that in the Finistère at Brest on October 21, 1954, at 19:30 "The witness tells her observation herself: 'I returned home Thursday, towards 19:30, and I had slightly bent down to get the key of the entry door which was in my handbag. It is when I stood up that I saw the machine. The latter appeared to me to come from the slaughter-house exactly as if it had just taken off. It had the shape of a glowing cigar, barred of a dark ring in its middle and surrounded by an aureole. It moved at a vertiginous speed, was suddenly rectified and the bolide then took the direction of the sea.' The observation lasted during several seconds." Luc Chastan indicates that the source is my website: "Les OVNI vus de près par Gross Patrick ** http://ufologie.net" (This being the old URL of the home page of my website). 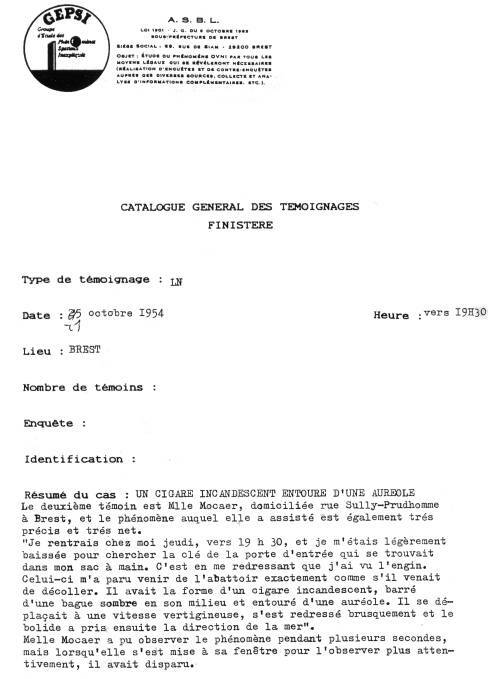 [ge1] Paper in the GEPSI ufology groupe file, France. 0.1 Patrick Gross September 23, 2004 First published. 1.2 Patrick Gross January 2, 2019 Explanations changed, were "Not looked for yet".